Sen. Jeff Flake, R-Ariz., speaks to reporters after announcing he will not seek re-election in October. "These speeches aren't necessarily just on the president, but on certain issues," Flake said. "The first one will be on the need to have shared facts that we all agree on." Flake first revealed his intention to begin the series of speeches to the New York Times Tuesday night after the paper reported that Trump is now questioning the veracity of the infamous 2005 Access Hollywood tape, where Trump was recorded bragging about groping and kissing women. During the campaign, he admitted that the tape was of him and dismissed it as "locker room talk." The Times also reported that Trump is again perpetuating the well-refuted conspiracy theory that his predecessor, former President Barack Obama, was not born in the U.S.
"Those are things that I think are empirically settled, and I think it's important that we recognize it as such. And democracy really depends on having shared facts, and I'll be addressing some of those issues," Flake told NPR. "It is damaging to a democracy if you say things are fake news that aren't, and portray facts as something else, so I do think that it's damaging to a democracy, I do," the GOP senator added. Flake's office did not have a timetable for when he plans to begin the series of speeches but said it would not be this week. Later on Wednesday, Flake also tweeted that it was "highly inappropriate" that Trump had shared several incendiary videos from a far-right British anti-Muslim party on Twitter earlier that morning. Those sentiments are ones Flake has expressed before, particularly in his book Conscience of a Conservative: A Rejection of Destructive Politics and a Return to Principle. In the book, released this past summer, Flake explained he was deeply concerned about the perpetuation of conspiracy theories and "alternative facts" peddled by Trump and his allies, such as conservative media like Fox News. Flake recalled how he faced blowback in Arizona when he told a Tea Party group he believed Obama was, in fact, a U.S. citizen and was subsequently booed "because I didn't subscribe to a right-wing conspiracist fantasy about our first African American president." He called it "a sobering experience indeed." "When a conspiracy theory becomes litmus-test orthodoxy, objective reality is at risk," Flake bemoaned. 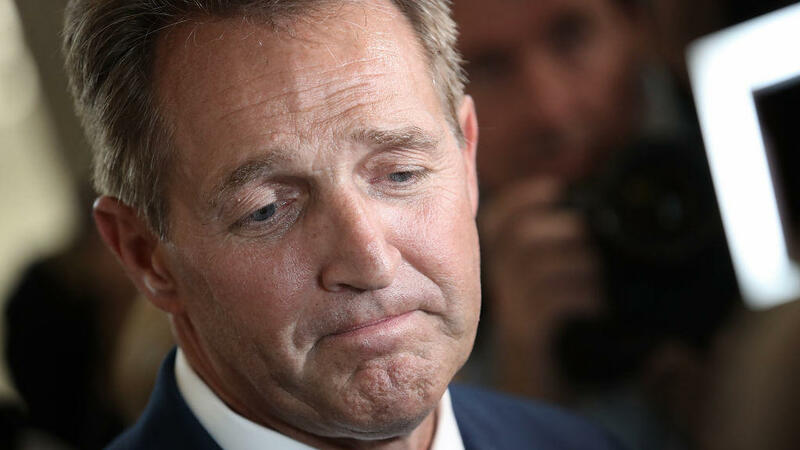 That approach didn't endear Flake to the conservative base in his home state, and he faced a very real possibility of being defeated in the GOP primary. But Flake announced at the end of October he wouldn't run for re-election. In doing so, he gave a scathing speech on the Senate floor about the current state of politics and the "flagrant disregard for truth or decency." Flake's outspoken criticism of Trump has earned plenty of jabs back from Trump, despite the fact that the president still needs his vote to pass his tax overhaul.